If you have been following my blog at all over the last month, you will have noticed that recipes containing summer fruits are featuring heavily. We are deep into our summer harvest and our weekends and spare moments are filled with picking and cooking up the bounty from our garden and forages. 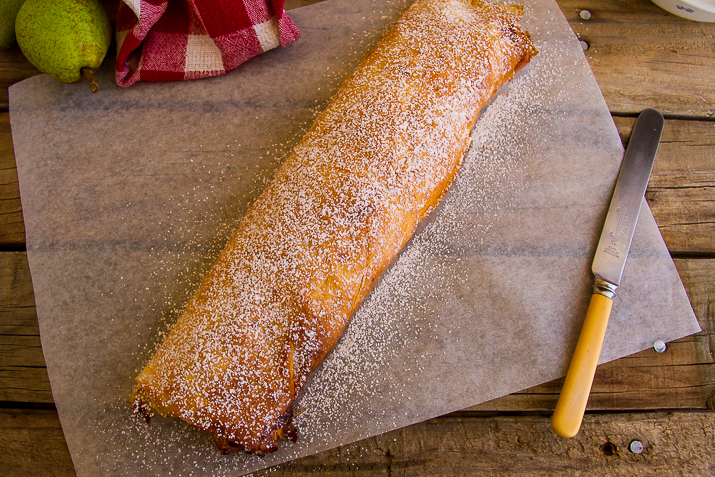 I made this strudel last weekend to take to church. I hoped that there would be a little bit left over so that I could have another sneaky slice once the kids went to bed. However it was delicious and there wasn’t any left to take home. Peel and dice the pears into 1cm cubes. Heat the butter in a frypan on medium. Stir through the pear. Cook for a few minutes. Add in the brown sugar and cinnamon, and stir to coat the pears. Add the water to the pan, and simmer until the liquid reduces to a thick syrup that coats the pears. Allow the pear mixture to cool. Layer 6 sheets of filo pastry together by brushing each one with melted butter and then stacking them on top of each other. Repeat with the second 6 sheets of pastry. Place the two stacks of pastry sheets end to end, with 3 centimeters overlapping. Pour the cooled pears evenly on the short end of the pastry. Roll the pears in the pastry. 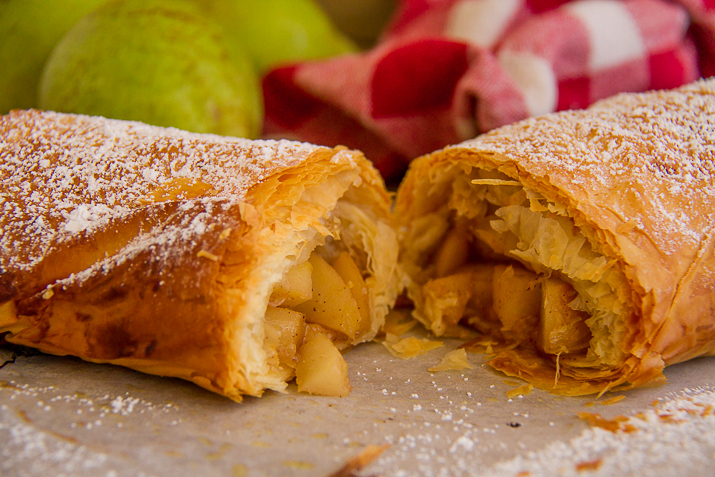 Continue so that the pastry makes many layers around the pears. Place carefully on a lined baking tray. Bake at 200*c for 30 minutes. Yum! Our apple tree is laden, pears didn't do so well this year. 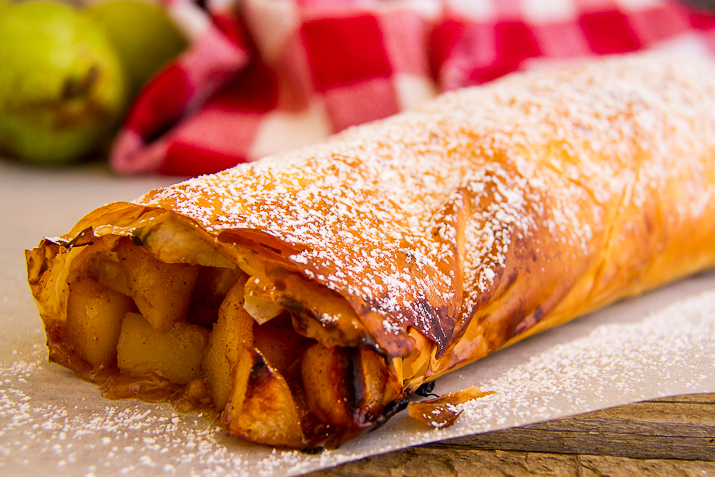 So may have to make the more traditional apple strudel myself! I feel as though you have just posted about my life. I live 50' from my in-laws on a dairy farm in Canada. If my kids aren't at home they are either in the barn or at their grandparents. I have no worries because there are so many eyes watching out for the kids. It was frustrating before because I felt like they could see the "going ons" at our house. That has since passed because this is our way of life. You are certainly right that you need respect to handle it. I love your posts as each one gives me the warm and fuzzies, knowing someone out there shares in my lifestyle. It sounds delicious. I am not surprised nothing was leftover for you.